Johnny Sweeps Pro-4 Rounds 3 and 4 at ERX Motor Park. The Greaves Duo and Yamaha UTV team took to the rich Minnesota dirt of the ERX Motor Park in Elk River, Minnesota for rounds 3 and 4 of the Lucas Oil Midwest Short Course League. This was the third annual trip to this unique track that features some of the fastest dirt on the circuit. It has tight turns, a couple of big sweeping turns, blind jumps, and a split track section. The whoops section created problems for a lot of drivers over the course of the weekend’s racing. Johnny swept the Pro-4 class. CJ came in a close 2nd in Pro-4 on Friday, but a race ending rollover on Saturday took him out of that race. He had some trouble, not of his own making, in Friday’s UTV race. He was collected in another vehicles rollover that took him out of the Pro Stock UTV competition. He started deep in the 34 car field on Saturday and was able to make it to 8th when the race ended. Rodney Van Eperen landed back-to-back 2nd place finishes to claim 1st place in the points standings in the Pro Mod UTV class. Adam Reek had a rollover on Friday and the damage kept him out of the race on Saturday in Pro Stock UTV. FRIDAY: Johnny and CJ Greaves lined up in the 4th and 5th spots for the 2×2 rolling start. 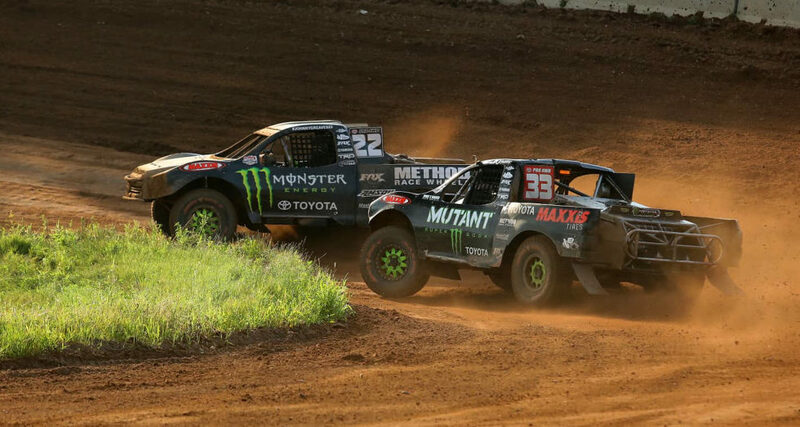 By the 5th lap, Johnny had taken his Monster Energy/ Maxxis Tire/ Toyota to the lead from Carlson. CJ made the pass on Hoek and used the split lane to pass Carlson to make the Greaves Duo 1 and 2 going into the competition caution. CJ looked inside of his dad on the restart but could not make the pass. The two put on a show for the remainder of the race but CJ could not find the line to pass the elder Greaves. Johnny took the win with CJ’s Monster Energy/Mutant Soda Toyota coming in a close 2nd. SATURDAY: Ross Hoek and Andrew Carlson started on the front row with Johnny and CJ on the 2nd row for the 14 lap race. By lap 3, Johnny had taken the lead. CJ was in 3rd on lap 3 when disaster struck for CJ once again. He caught a rut and rolled in the hairpin turn. He landed on his wheels and was able to continue for a lap but had to pull out with mechanical problems. FRIDAY: Disaster struck for CJ Greaves in his Monster Energy Yamaha Racing/Maxxis Tire/Yamalube YXZ 1000R and Adam Reek in his Yamalube/Maxxis Tire Pro Stock UTV. CJ, starting from the back, was buried in the field and was patiently working his way around one UTV after another when the #41 vehicle almost end-over-ended and collided with CJ. The collision sent Greaves’ Yamaha into multiple rollovers and ended his day. Shortly after CJ had his mishap, Adam had a major rollover in the exact same spot ending his day. The mechanical damage was irreparable, taking him out of Saturday’s race as well. SATURDAY: There were 34 entries in the Pro Stock UTV class. CJ and Adam would have to pass just about all of them starting deep in the pack. CJ made it to 12th by lap 5 but a rollover brought out the yellow flag which also served as the competition caution. On the restart, CJ was able to move into the top 10. He made it as high as 8th before the race was unexpectedly cut short by 5 laps. Adam was not able to race his Yamalube/Maxxis Tire Pro Stock UTV Saturday due the damage from Friday’s race. FRIDAY: Rodney Van Eperen PowerSports1/Maxxis Tire Pro Modified UTV started in the back of the field due to missing qualifying. But it didn’t take him long to He worked his way up to the front. He managed to dodge several rollovers and landed in the 2nd place position at the competition caution. Rodney worked hard to find his way around the front runner but landed the number 2 spot on the podium. SATURDAY: Saturday’s race was almost a mirror image of Friday’s race. Rodney Van Eperen started in the middle of the field but quickly worked his way up to 2nd where he stayed the remainder of the race. Kyle Chaney was basically on rails and unpassable. Rodney had his hands full holding onto 2nd which he did to take his 3rd second place finish of the season. His 3 second place finishes and win has him at the top of the points standings. Bark River Off Road Rumble in the U.P. is next on the Lucas Oil Midwest Short Course League schedule. The Greaves Duo / Yamaha Racing team will head to Bark River International Raceway in Bark River, MI on August 10th and 11th.